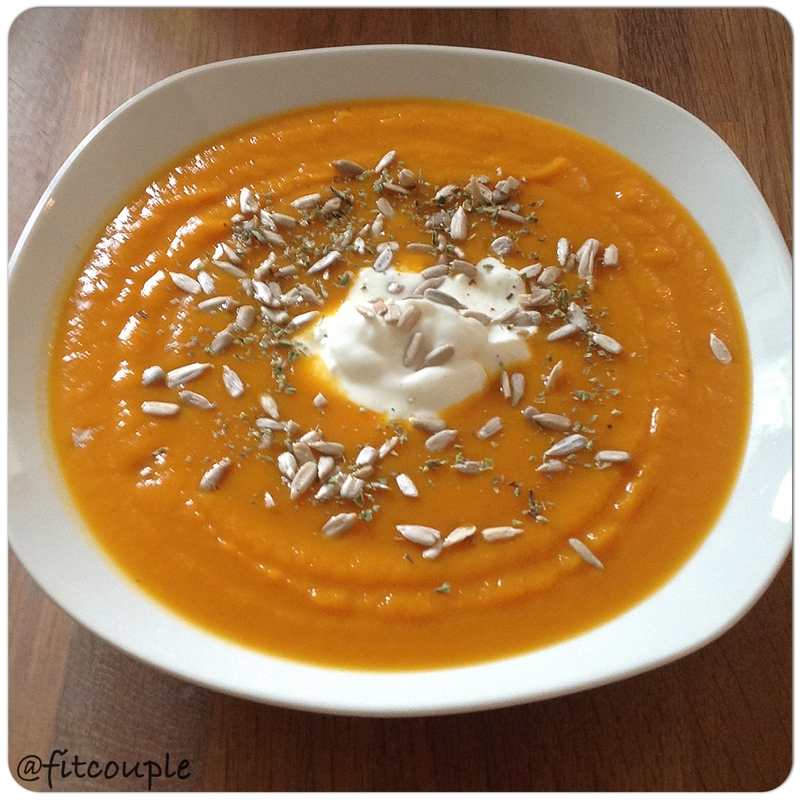 Easy, delicious, low fat and clean pumpkin soup. You can use hokkaido or butternut squash. Wash, peel and chop the Butternut Squah. Heat 1 tsp olive oil in a pot and quickly stir fry the Butternut pieces in the pot. Add 1-2 liters of water (depending on the size of your pumpkin and on, how thick/ creamy you want the soup to be) and let the Butternut pieces cook. Chop the Ginger into 4 bigger pieces and add into the soup. Season with Cayenne Pepper, pepper, vegetable broth, curry and cook until the Butternut pieces are soft ( about 20-25 minutes). Blend the pieces and the water in a food processor/ blender until creamy, get it back into the pot and heat it up till the soup is cooking. Take off the heat, and serve with 1 tbsp. low fat quark/ greek plain yoghurt, fresh herbs and a sprinkle of sunflower/ pumpkin seeds.